Art and fashion have always had a close relationship. But perhaps the most extreme marriage of the two is wearable art. We’ve seen it in haute couture, in experimental runway shows by international designers such as Rick Owens and Alexander McQueen, and in celebrities dazzling at the Wearable Art Gala in Los Angeles. For those unfamiliar with the term, wearable art is exactly what it sounds like. With an emphasis on extravagance and beauty, rather than comfort or functionality, wearable art has been on the scene for a long time now. Dipping into the world of extreme innovation and fantasy, in terms of the materials used – such as wire or plastic, or more intricate and costume-like – artwear refers to individually designed pieces of either unconventional jewellery or clothing. 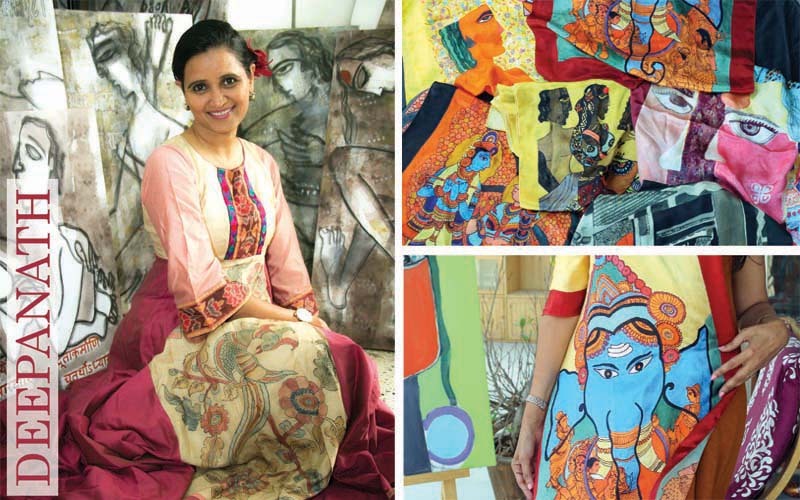 Lately, Indian fashion designers and artists too are embodying the arty appeal in matter and mind, and are experimenting with wearable art patterns. Meet the eight visionaries from the city who are making fashion more artistic, and art more fashionable! Gaurang Shah is the future. Still the future. 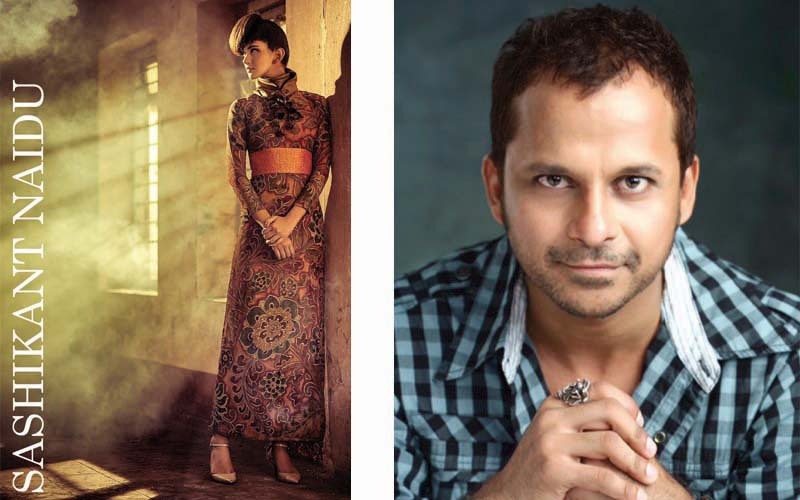 The 45-year-old fashion designer has long been the headlight for traditional weaves. Over the past decade, his eponymous label showed how innovative design can embrace traditional textiles, weaves, embroidery, and block prints, rethinking traditional structures. We chat with the self-taught designer who combines his natural creativity with productivity and hard work, to create a world-renowned brand. Textiles seem so important to you. In what direction are you innovating in this field? Innovation is endless; it is an enduring, never-ending practice. What we try to achieve is to present traditional Indian textiles in different forms – in colours, texture, and design. We use our signature jamdani weaving technique, infusing modernity to inspire ageless forms of art, artistry, and architecture without sacrificing its sensibilities or aesthetics. We have introduced several innovations, like the big border sari – a fusion of different Indian textiles. Season after season we have presented new forms of weaving techniques, like the ardhangini and chitravali to muslin and neel. In our most recent innovation, we have experimented with natural dyes called neel. We’ve created a traditional catalogue of clothes using Kota cotton, light Maheshwari and infused fine count khadi (300-500 thread count) from Bengal. We also introduced new appeal to ikat patolas from Patan that involved resist dyeing indigo in the final stage, after the other colours were applied. We also brought back the glorious hath-katti embroidery, indigo-dyed dhoti pants, ijar pants with dhakai technique. What is the distinguishing quality that separates an artist-designer from a fashion designer? An artist-designer envisions his work as a piece of art; his creativity is not driven by commercial wisdom. He is creating art, and that always remains his foremost characteristic. Everything else becomes like a tributary. It is their approach to translate their artistic dreams differently. The biggest differentiator lies in originality; a fashion designer has a huge challenge to maintain sustainability in his or her brand. The biggest fear is going extinct and fading away in the consumer’s attention. You dedicate a lot of time and effort towards making your elaborate designs. What’s the most complicated garment you’ve ever made? Every design is a vision, to realize a ‘new life’. It is a result of many months of a painstaking complex process from sketch to looms and then to reality. Every garment is unique but goes through the same creative course. We are in a business of being unique, and so we need to stand out with pieces of fashion that are timeless and adorable. For me, reviving any weaving or textile technique is complex. Be it jamdani when I began, Patan patola in 2012 and now creating chiffon on a handloom. It takes years to get the textile right. Do you think there is a distinction between art and craft, and especially between the crafts we find in fashion studios and the art we see in museums? Both have their own place and recognition in this universe. It is a result of creativity and thinking beyond the average. There is no distinction. Our craft is inspired from the art. If we didn’t have museums and records, the world would have been devoid of ‘craft’ inspiration. You are heavily influenced by the aesthetic; how does this show up in your work? And what techniques do you use to make your pieces? There is no question about it. Every piece that I create needs to carry grandeur and appeal. It needs to sparkle a woman’s eye every time she finds it laid out in front of her. It must have that distinctive appeal which eventually means it finds its way into their wardrobe. So, what’s next on your agenda? I’ll continue to travel the creative universe of being un-equal and create handwoven Indian textiles fashion pieces that will withstand the test of fashion trends, season after season. I am also in the process of discovering disappearing textile techniques, revive them and introduce saree to global Indians as the supreme fashion statement. Priyanka Aelay shot to fame in the national art world at the age of 22, when she held her debut solo art exhibition in the city. Known for aptly merging subtle elements of folk painting with a range of subjects and colours, Priyanka produces vibrant masterpieces that grow on you, slowly revealing their secret charms. The young and dynamic artist has now started combining artworks with even more elements. You have done amazing work in the field of art. Could you tell us how you became interested in fashion and, as you like to call it, accessible and useful art? I think nowadays it has become so important that one should be capable of accommodating anything to be useful and accessible. And personally, I like and enjoy working on these ideas. I became interested in accessible and useful art when I saw that fashion can be more than just clothes. I no longer want my art to be just hanging on the wall. And I’ve always wondered about people who are not interested in art… how to draw their attention towards it. With this objective, I’ve tried making something more accessible for them that lies on the border between fashion and art, so that people will start appreciating it. How do you personally describe your process of merging fashion and art? For somebody who is new to the art world, it is important to create something fresh, colourful, attractive and easy to understand. So when I make any accessible art, I follow all of these principles to maintain them in my work. Hence I choose simple and useful materials. I merge the artwork with materials that one could use on a daily basis. Talk us through the mediums you use in your work, and why you choose them? I have been experimenting with my work. Currently I am working with wooden boxes, which can be used for gifting or for storing jewellery. Basically, you could keep anything in them. I have earlier made some dupattas, sarees, jewellery, and painted on the bottles, too. But of all the things, wooden boxes caught my fancy. They are elegant and reflect the many nuances, shades and qualities that form an indispensable part of my work. There’s no question that Jaya Baheti is an artist who treats tradition not merely as a thing of the past. For her, tradition is an ever-present, ever-renewing living reality, palpable and accessible today, as it was for the old masters. 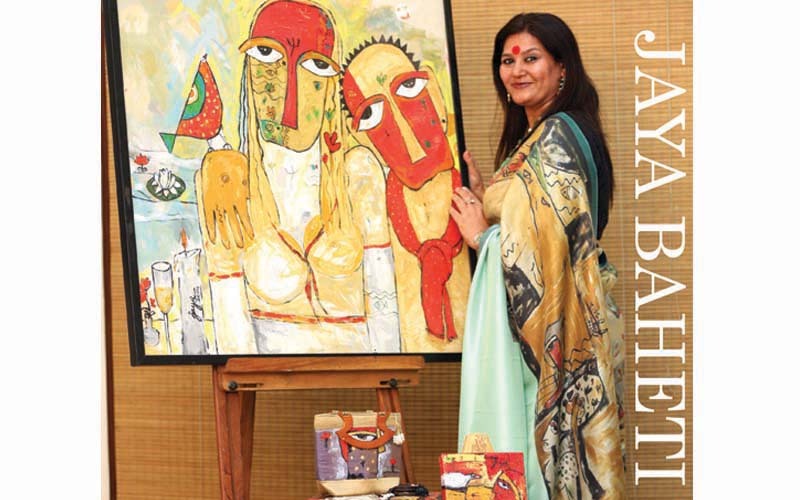 Baheti comes to mind as a refreshing example of an artist whose work effortlessly combines colours, print, and painting. Pushing boundaries and establishing new dialogues dealing with femininity, gender roles, and the importance of community, Jaya has grabbed the attention of both local and global fashionistas. Your designs are incredible and so unique. When did you first realise your passion for creating these one-of-a-kind pieces? always an exciting and liberating experience. Print and graphics are significant in your aesthetic. How did you develop your style? I believe aesthetics are evident for any brand, once they have a clear vision of what they want, and practice the same. Devotion to your work and your profession, in my opinion, is the essential aspect that an artist brings to their craft. The relentless hustle to curb your creative hunger, and the need to outdo no one but yourself, is always strong. The perseverance and work ethic must be strong – it’s what my parents have taught me since I was young. It’s crucial to be patient and serious towards your profession. Tradition versus innovation – where’s the balance? I think tradition and innovation go hand in hand, and are not mutually exclusive of each other. The synergy created by the harmonious conjunction of these two strikingly complex and polar opposite qualities is something that is unparalleled. Congratulations on your recent exhibit in London! How did it feel to receive the recognition of your pieces being viewed as art? world gives me a sense of viewing it with my third eye. If you could explain your artwork to the world, how would you describe it? If I had to explain my art, I would say that it’s an abstract representation of the reality of our society. It’s a free-form representation of whatever happens around me, and inside me. 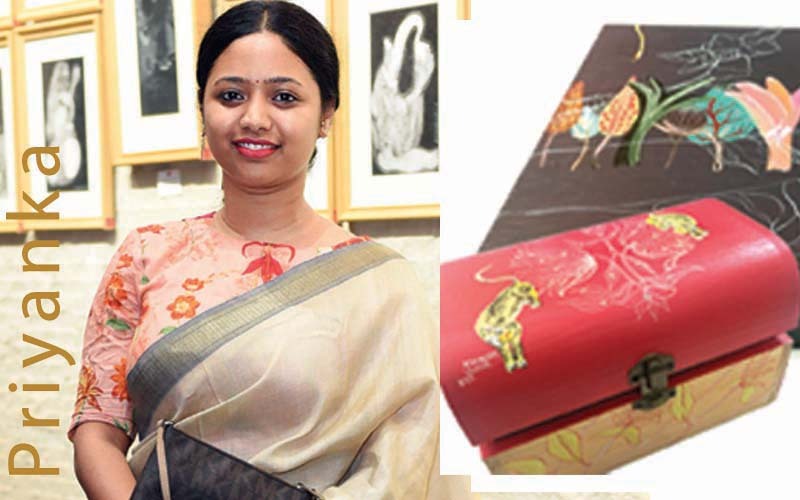 Her name is synonymous with reviving the art of Kalamkari. And Mamata Reddy effortlessly unites the traditional textile, motifs, and weaves with simplicity and contemporary design. 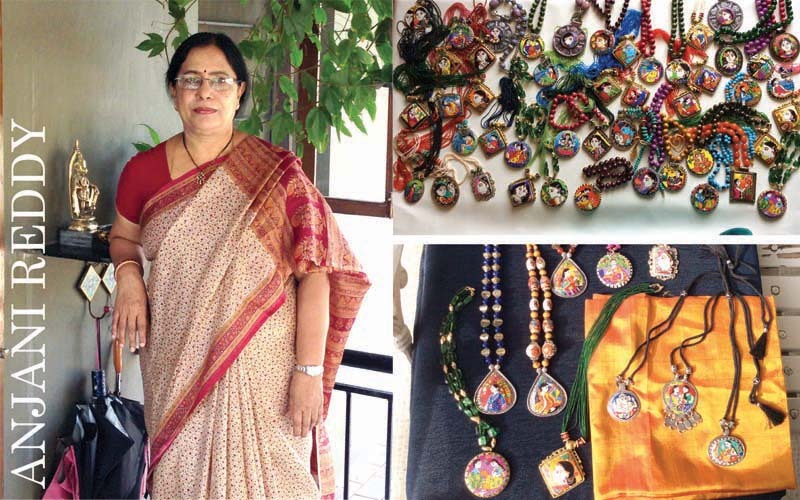 Fascinating us with her work for over two decades, Mamata’s innovative and seamless designs have not only impressed Indian audiences, but have won applause from international connoisseurs as well. You seem very passionate about culture, taking in and absorbing elements from many different strands. How does culture influence your creative process? We live in a country that is so rich with culture, and that is something I embrace. Our ancient traditions and stories are so beautiful and need to be shared. Kalamkari is a culture. It depicts mythology and stories from our traditions, and that is what stimulates the art. At one point it was a dying art – not because it wasn’t good, but because the artists did not have the exposure they needed. To me, culture and community go hand in hand. And that is what influences my creative process. What can I do to help my artists? How can they thrive and, in turn, help the art thrive? Their passion and hard work drives my passion and my need to improve and think of fresh new ways to showcase the art. Sometimes it’s tough, because to stay relevant and at times to make money, you have to go with the trends and give customers what they want. It is always important to make time for yourself. Travelling and interacting with artists across India is how I relieve the monotony of doing business. When I am in a new place, the creativity just automatically flows to the point where I just can’t wait to get back to work on a new project or idea. At that point, I can introduce new styles and concepts that I am confident my customers will love. The colours, textures, and base fabrics are what I play with; I set those limits. By creating these boundaries, I know it will be commercially viable, yet it gives me a playground to experiment. How has your design developed since you began, and how do you see it evolving? 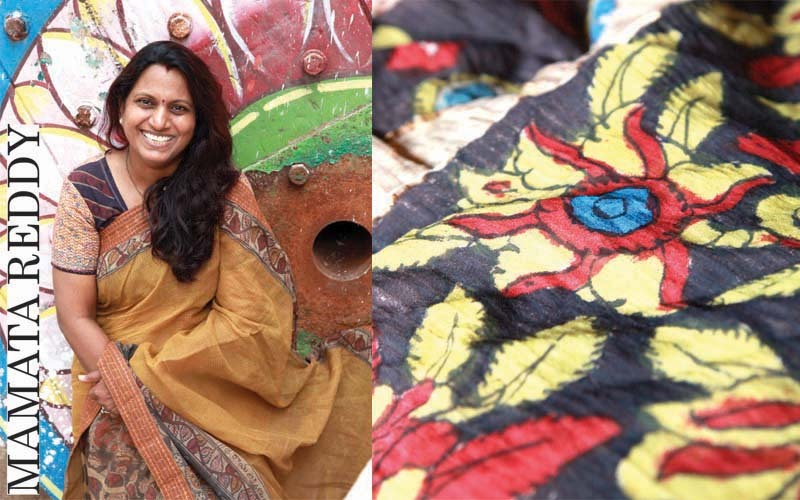 I have changed, adapted, innovated, and pushed Kalamkari with the vision of the designers I have worked with. Each collection is unique and there is no telling where it will go next. All I know is that I will evolve and so will the craft, with each new vision and new designer. I am in the process of opening up my new store and a work retreat – for this I am collecting and creating the masterpieces. I am extremely excited about this space and hopefully can bring you more news soon. Apart from that, I have a few ongoing projects with designers as well. How do you incorporate art into your fashion work? For me, fashion is a work of art where one uses his/her creativity. They give their ideas a form by bringing together various elements. Designers create end products that speak of their signature style. 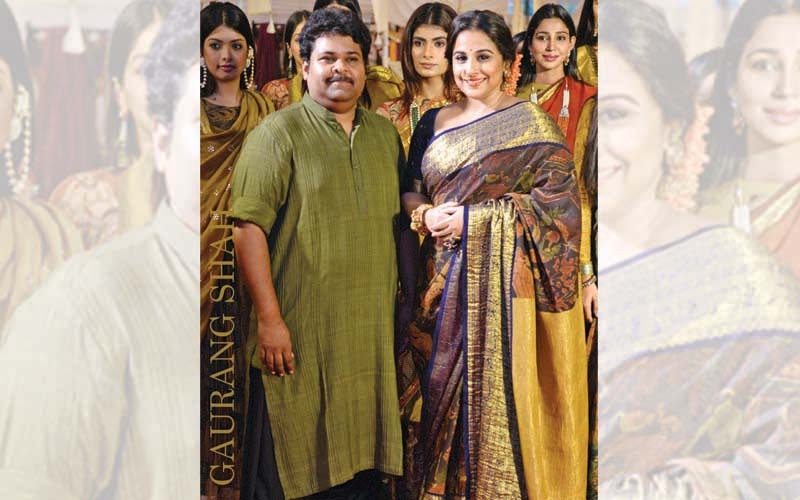 Being an avid lover of Kalamkari, I have worked with talented artists from the temple town of Srikalahasti, and my love for this art form has made me incorporate it into my collections season after season. I enjoy sitting with the artists, explaining the theme, making samples, incorporating their ideas, and their perceptions of my concept. All of this makes the whole process quite painstaking. Yet the breathtaking results make it all worth it, giving form and life to my ideas. How would you define the ethos of your label? Clean cuts and subtlety are the core elements of the brand Sashikant Naidu – making practical yet innovative clothing. It’s a label inspired by Indian culture, heritage, tribes, and colours. We make eco-friendly clothing using natural dyes and fibres, focusing on sustainable fashion. In your opinion, do you think true creation in fashion is still possible? Season after season it’s the same rigmarole of making heavily embellished wedding trousseaus in fabrics imported from China that the biggest names to the unknown survive in the Indian fashion industry. And this is a country which demands rip-offs and look-alikes more than original clothing, which is a setback for designers who are innovative yet succumb to this demand. India is still a country that decides the fate of fashion based on marketing and packaging, rather than on the credibility of the product. And when designers create something incredible and innovative by fusing techniques and weaves of different regions, it can actually damage the original, which has a long history and legacy associated with it. I actually wonder if true invention in fashion is still possible! Spring/Summer 2018 is all about organic clothing. We have used natural dyes, hand block prints, and hand embroidery in sarees, blouses, skirts, tunics, stoles, and dupattas. We’ve followed a theme that connects flora and fauna with humans. We are working only with natural fibers such as hand-woven cottons, khadi, tussar, and muslin, dyed in a mélange of eco-friendly colours. While the designs are contemporary, the silhouettes are easy and the fabrics are comfortable. 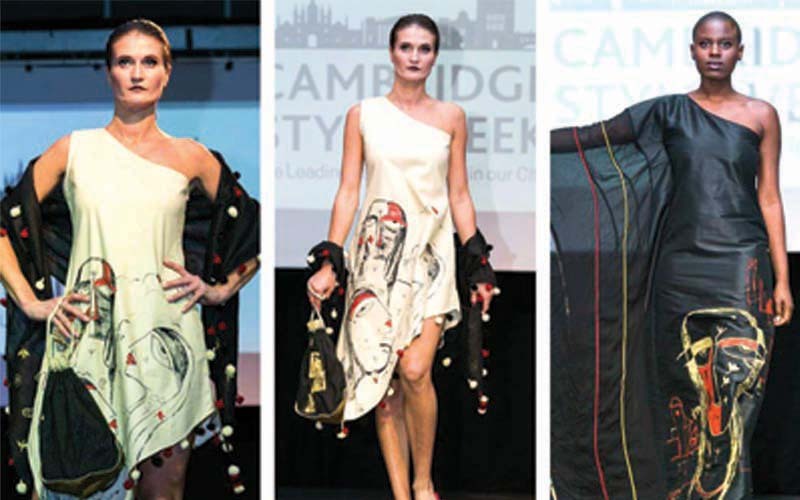 Deepa Nath’s designs are beautiful, bold, and vibrant. All hand-illustrated, her accessories to clothes amalgamate delicate drawings with playful and quirky aesthetics. With designs that cover everything from a deity to traditional motifs, Deepa transforms everyday clothing and jewellery into works of art. First and foremost you are an artist; what drew you to a collaboration with fashion? I’m always an artist and that doesn’t change if I’m thinking about fashion. For me, clothing is very accessible. I remember ever since I was a 15-year-old, I was always passionate about designing clothes, and I don’t think art should be excluded from that arena. Last year in December, I created my functional art (trays and jewellery boxes with my artwork). I guess one shouldn’t judge a work of art purely on the medium it manifests itself in. If you were to describe your work in three words, what would they be? My work is unique, eclectic, and sophisticated. What inspires you the most, when designing your creations? Most of my wearable art is inspired by my own artwork. I remember when I looked at some of my paintings that had so many hues, tones, tints and shades; I felt it had to come out to cater to more people. Plus, the end result of the creations has a certain refreshing momentum and life of its own. Generally, how do you feel fashion and art mix together? Are they indistinguishable or are they very different? I feel they are not very different. Art and fashion have been long intertwined, right from the times of Jackson Pollock and Salvador Dali. For me, both require imagination and visualising for the end result, which is why the two can easily collaborate. It’s a creating process though; not just wearable art, but the most carefully created fashion statement pieces carry art within them, be it the print, embroidery, or the fall of the garment. This is visible in my collection, as well. When I design clothes, it is not so much about the latest trends, but about aesthetics, elegance, and something that transcends the time. What are the main concepts translated into your work? inspired by deities and Kalamkari art. My work is very contemporary and I keep adding new dimensions with colours and motifs. In Anjani Reddy’s paintings, representation and abstraction encounter one another in a vibrant manner and question the relationship of painting and observing. Tasting success in the early 90’s with the bold semi-abstract style – which she displayed through her ‘Dwellings’ series – her art is connected to her interest in nature. She experiments with the physicality of paint and surface, and the explosion of colour and design reveal a tale hidden in layers of tones, taking the viewer on an enthralling voyage of discovery. In conversation with us, the artist discusses the two forms. When did you first start to think outside of the canvas as an artist? What is more important for art, the idea or the execution? Both; the idea has to be executed perfectly and precisely so as to match with the artist’s perception. Do you think art and fashion can ever really be separated? No, not really, they complete each other. Art is about meaning whereas fashion is about feeling. Would you say that your work is introspective? I always have been introspective of my work and I believe that art is a form of self-expression and creativity. All of your designs are colourful and playful; where does the inspiration come from? I take my main inspiration from nature and daily observations. I grew up in Hyderabad in a surrounding with the highly decorative Deccan miniature paintings. Apart from the beautiful figures of men and women, the region has always been famous for its rich designs and colours. After exhibiting my ‘Dwellings’ series, where the natural transition led the women to emerge and take centre stage on the canvas, I have ensured that the underlying expression of love for inner peace and harmony is visible as the common narrative through all my work. The entire aim of my work is to elevate the human spirit. I also want to be remembered as an artist or a teacher, whose creations have helped transport the viewer into a world of love, peace, and harmony. What do you have planned for, this year? I am preparing for my forthcoming exhibition. Ghanasingh Be True’ is considered a rare breed of ewellery brand whose creations feel like wearable works of art. The label, with a legacy of 115 years, has watched it grow into a cult fine-jewellery brand that has seen the fashion crowd flocking to snap up a piece of their special brand of wearable art. 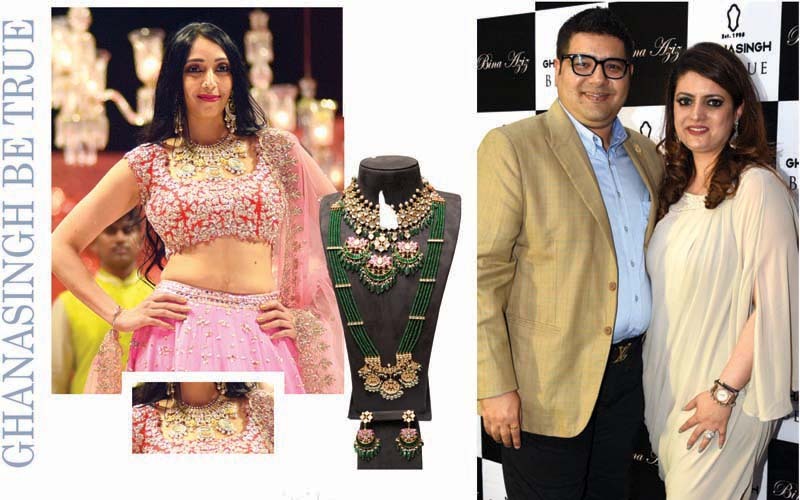 Hailing from Mumbai, husband-and-wife team of Gautam and Krishaa Ghanasingh brings their passion for stunning stones and unique design to their audiences. How would you describe your designs? What makes your collections unique in the industry? Our designs and collections are internationally inspired. We, as a fashion jewellery brand, contain both conventional and unconventional materials and fuse it with interesting textures. Our creations are sophisticated, elegant, pure, and timeless, and forms highlight a certain aspect of their design. Your wearable art collection has a strong artisanal feel. How essential is it for you to retain the hand-crafted element? Everything is made by hand, from the design sketches to the finished product. What we do is very intimate, just like the jewellery itself. To wear something on your skin is a very personal thing, and we cherish that by ensuring authenticity. Jewellery is essentially art, and there is more value in art that’s handmade than what’s produced in factories. Do you have a typical woman in mind when you are designing your jewels? Our designs are for everyone. We create unique pieces to be loved and enjoyed by women of all ages. The collections have been designed to appeal to every individual, but we would say that they are meant for a woman who is confident and one who appreciates jewellery as much as other forms of art. Our latest collection, Belleza, is meant for one who appreciates beauty in the little details of life. The collection is the epitome of grace and beauty, where each design is created with passion, retaining purity and strength. It is an amalgamation of two forms of artistic expressions – jewellery and art, that stand out and leave a lasting impression. What thematic jewellery is in vogue now? Well, modernity is the new fad when it comes to jewellery today. So, tassel necklaces and diamond chains are something one can drape in many different ways to express their personal style. Your latest collection is the absolute form of art translated into jewellery. Can you tell us more? For our latest collection, Belleza, we’ve collaborated with art maestro Bina Aziz. The underlying inspiration of these master creations is the birch leaf which is a common thread across the entire collection. Limited edition customized cocktail rings, chandelier earrings, jhumkis and chaandbalis, long layered neckpieces, and statement haathphools are beautifully handcrafted to mirror the intricacies of the design.